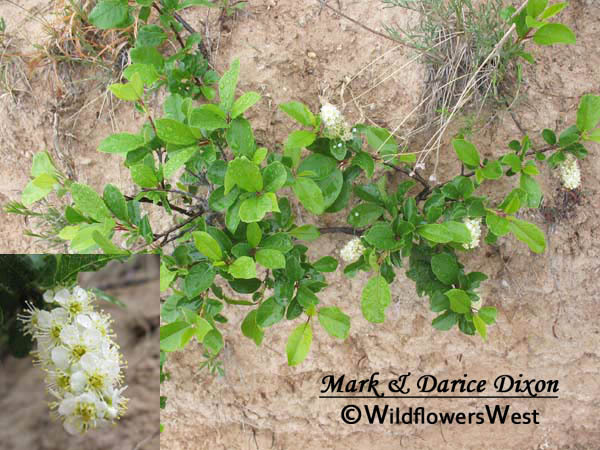 This widespread flowering bush enjoys a wide turf but this specific variety unfortunately harbors a pest caterpillar called the Tent Caterpillar which poses a threat to fruit bearing plants. The plants are also toxic to horses, especially after wilting. The name of the plant may come from the fact that a poisened horse will exhibit symptoms of heavy breathing, weakness, and agitation. This species is native to North America. 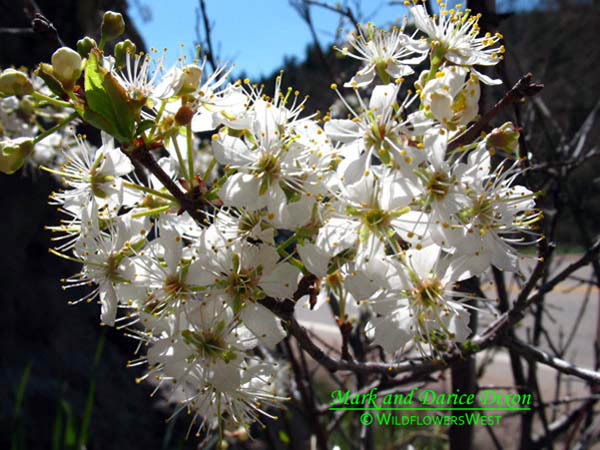 The Western Chokecherry can be distingused from it's counterpart the Common Chockecherry by a downy haired underside of the leaves. USES: From the interesting website Native American Ethnobotany are the followinbg uses by native american tribes: Abnaki - Fruits eaten for food. Algonquin - Infusion of bark and sweet flag taken for coughs. Cherries used to make wine. Cherries eaten fresh and made into preserves. Apache - Berries eaten fresh. 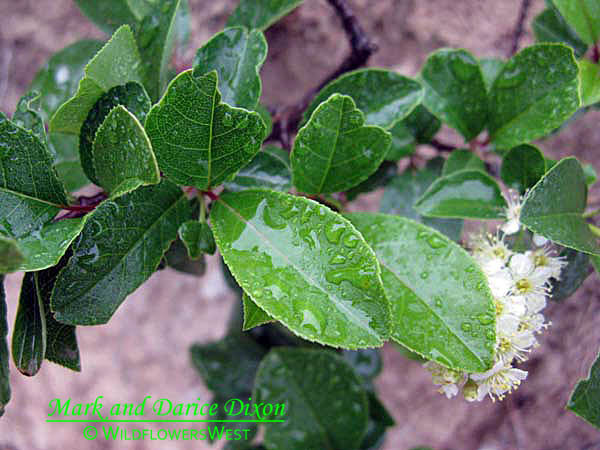 Blackfoot - Berry juice used for diarrhea. Infusion of cambium and saskatoon taken as a purge. Infusion of cambium and saskatoon taken by nursing mothers to pass medicinal qualities to baby. Berry juice used for sore throats. Straight branches used to make back rests. Juice given as a special drink to husbands or the favorite child. Berries greased, sun dried and stored for future use. Crushed berries, mixed with backfat and used to make pemmican. Crushed berries, mixed with backfat and used to make soup. Peeled sticks inserted into roasting meat as a spice. Hard wood used to make incense tongs. Root digging. Cherokee - Compound used as a blood tonic. Infusion of bark taken for colds and coughs. Astringent root bark used in a wash for old sores and ulcers. Decoction of bark used as a wash for chills and fevers, including the 'great chill'. Boiled fruit used for 'blood discharged from bowels.' Used in steambath for indigestion, biliousness and jaundice. Warm infusion given when labor pains begin. Compound of barks added to corn whiskey and used to break out measles. Decoction of bark used as a wash for ague. Decoction of inner bark taken to loosen phlegm for hoarseness. Decoction of inner bark used for laryngitis. Wood used for lumber and to make furniture, also carved. Cheyenne - Fruit used for food. Unripened berries pulverized and used for diarrhea. Dried, smashed, ripe berries given to children with loss of appetite. Dried, smashed, ripe berries given to children with loss of appetite. Fruits pounded, formed into flat cakes, sun dried and used as a winter food. Berries boiled, sugar and flour added and eaten as a pudding. Limbs used to make arrow shafts and bows. FUN FACT: Blackfoot members made a special soup for ceremonial events. These ceremonial events included the transfer of a tipi design or the opening of a Medicine Pipe bundle or a Beaver bundle. The woman prepared the soup from berries, assorted roots, fat and water. At an appointed time during the ceremony this soup was served to all participants. The soup was blessed, and an offering of one of the berries was put back into the ground, before eating began. A few mouthfuls were taken; then the remainder of the soup was given to one or another of the women, who would take it home to her children.